Games of Thrones season 8 is landing on our TV screens in just over a week's time (April 14 US, April 15 UK), and while that means we don’t have much of a wait left to find out what’s coming, a Redditor with a keen eye may have just uncovered a major spoiler in a recent season 8 promo trailer. Now it goes without saying that this isn’t confirmed, but if you’re wary of anything spoiling the new season for you, this is your final warning. Proceed with caution. A handful of days ago, HBO dropped three new promo trailers titled “Survival”, “Together”, and “Aftermath”. Fans of the series immediately took to the Freefolk subreddit to pick apart the trailers and speculate over the footage shown. The “Together” promo - which can be seen below - caught the eye of Reddit user Spiral66 who believes it could point towards a major spoiler in the final season. In the trailer, Jon Snow and Daenerys Targaryen can be seen for a few seconds standing in front of a stone fireplace at around the 0:10 second mark. Redditor Spiral66 believes the stone fireplace is the very same one found in Dragonstone, which would place the pair there. So why’s this such a big deal? 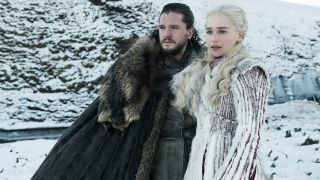 Well, in the final season we know the big battle against the Night King's forces at Winterfell is going to take place, and Jon and Daenerys will be in the thick of it. They would likely retreat to Dragonstone after the battle, which could mean they both survive the fighting. In the “Survival” promo we can see as the characters all prepare for battle and whatever fate may await them. And in true Game of Thrones form, it doesn’t look particularly good for anyone. From the comparison image Spiral66 posted (seen below) of the the shot from the trailer and a shot from a previous season, it really does look like Dragonstone. At this point anything could happen. We’ll just have to continue to speculate as we anxiously await what will not doubt be a memorable conclusion to the show.